The fourth run of the World Street Food Congress is set to be BIGGER, BOLDER and BETTER! Isaw, taho, goto, balut, iskrambol - these are some street food items I grew up with. This informal fare is a staple on the diet of a budget traveler. It's cheap, tasty and easily found in the local market, on narrow alleys, or sometimes, just along the busy streets. Some might be discouraged to buy but street food is essential to your destination's culture and identity. Get ready for a larger congregation of heritage food advocates, industry think tanks, international delegates, hawkers and street food fans at SM Mall of Asia Concert Grounds, Sunset Avenue corner Asian Drive, Pasay City! It's five days of feasting during the World Street Food Jamboree, with over 30 master hawkers and pop ups from Indonesia, Thailand, Japan, Taiwan, Malaysia, Vietnam, India, China, Germany, Mexico, USA, Singapore and host nation, the Philippines! Food from six cities and regions - Davao City, Bicol, Pampanga, Iloilo, Ilocos and Bacolod, will be featured for this year's Filipino specialties. The WSF Jamboree is open to the public. Purchase entry coupons for P150 at the ticket booth onsite, comes with free P150 value of food and drink vouchers. Food items are priced at P150 onwards. Grab the chance to taste Soi Lum, chrysanthemum broth mochi dumpling from Guangzhou, which will be sold outside of China for the first time during WSFC17. There's also Coffee Pork Rib burgers from Singapore, Claypot Apom Manis from Malaysia and Oh Ah Jian (Taiwanese style oyster omelette). BBQ Pork Ribs from Bali and Chocolate Martabak from Indonesia are also back by popular demand. This year's theme is Re-Imagine Possibilities. 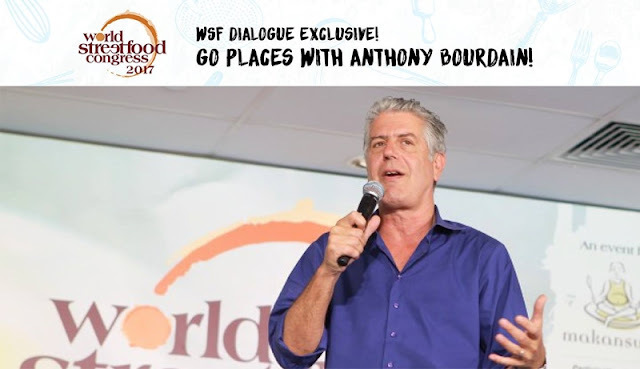 International food and travel celebrity host Anthony Bourdain is one of the dialogue speakers/presenters for the World Street Food Dialogue, where he will share about his upcoming Bourdain Market in Manhattan, New York. Joining him are Michelin Star chefs Malcolm Lee (Singapore) and Andy Yang (Thailand), Peter Lloyd (Owner, Sticky Mango Restn, London), Shen Tan (co-owner, Revolution Cafe and winner of Palermo Street Food Festival '17), David Yip (Food Anthropologist and writer representing China), Odilia Wineke (Detik and CNN Indonesia Food Editor) and Sangeeta Singh (Nasvi, India). California Institute of America (CIA) VP Strategic Studies and Industry Leadership Greg Descher will give the keynote speech. Makansutra founder and WSFC Creator/Curator KF Seetoh and WSFC Captain for Philippine contingent Chef Sau del Rosario are co-moderators. Dialogue tickets are priced at $250 and can be purchased HERE, inclusive of entrance to WSFC17 + lunch, refreshment and snacks on both days + conference materials + goodie bag. Corporate bulk tickets and student discounts are also available. Learn first-hand how iconic heritage and street food dishes are made. There will be cooking demonstrations from Chef Claude Tayag, Chef Malcolm Lee, Peter Lloyd and more! If you think you have a grand idea that one day could move mountains and transform lives, then shout it out on stage! Pitch Box Hackathon is a 90-minute segment where delegates pitch their ideas, visions, concepts or goals to a captive audience. Twenty-four (24) heritage street food players will be announced as the world's best hawkers during the Dialogue. For updates visit the World Street Food Congress website and Facebook page. Use the hashtags #WSFC17 #Makansutra #worldstreetfoodcongress #itsmorefuninthephilippines #tpbdelivers #tpbgovph when posting on your social media accounts. Photo and video credits to WSFC and Makansutra.